Throw a mystery dinner party with friends. Plan a fun mystery dinner party menu that will keep guests guessing. At one of these parties, the fun is built around the food. 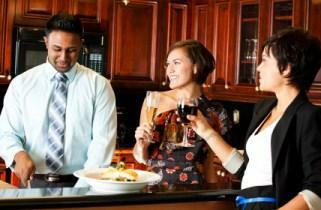 A mystery dinner party can also be called a hidden or surprise dinner party. The surprise is not the party itself, but rather which foods the guests will be eating. Traditional dinner parties sometimes have a full menu on each place setting, or the cook offers up the courses without any special fanfare. At a mystery party, the dinner is a secret. Often, the cook or host asks guests to place an order off a menu made up of silly names or clues about what each item is. Next, the host will serve the guests each item they chose. Most parties have several dinner courses; some allow guests to have utensils right away, while others need to order those items off the menu. A variation on this is to turn the mystery dinner party menu into a dinner party game. List all of the foods you plan to serve on a sheet and ask guests to write down their predictions for the food. The person with the most foods or courses right wins a small prize. This is a fun thing to do at a dinner party that does not otherwise have a theme. Alternatively, you can also choose foods that fit into a dinner party theme, such as luau foods or finger foods. To make things easy for your guests, have separate sheets made up for each course. Allow the guests to circle two to four items for each course. If you want, you can separate each course into their own categories so guests know they will be eating salad first and dessert last. On the other hand, you can let them order what they wish and eat it in whichever order it arrives, even if this means eating ice cream followed by a pasta salad. Instead of simply listing silly names for each mystery food, you can also make the menu fill-in-the-blank. For example, a drink list could include _____ and cookies (milk) or _____ battered (beer). Hosting the mystery dinner takes a little extra planning. You need to keep everyone out of the kitchen while you are finalizing the food preparations, so be sure to have plenty of games on hand to keep everyone busy. Also, you need to be sure that your guests understand how the mystery dinner works. This is easily done by standing at the front of the table and explaining it. However, if you think some people may object to this style of dinner, it may be best to give everyone a heads' up in the dinner party invitation wording.